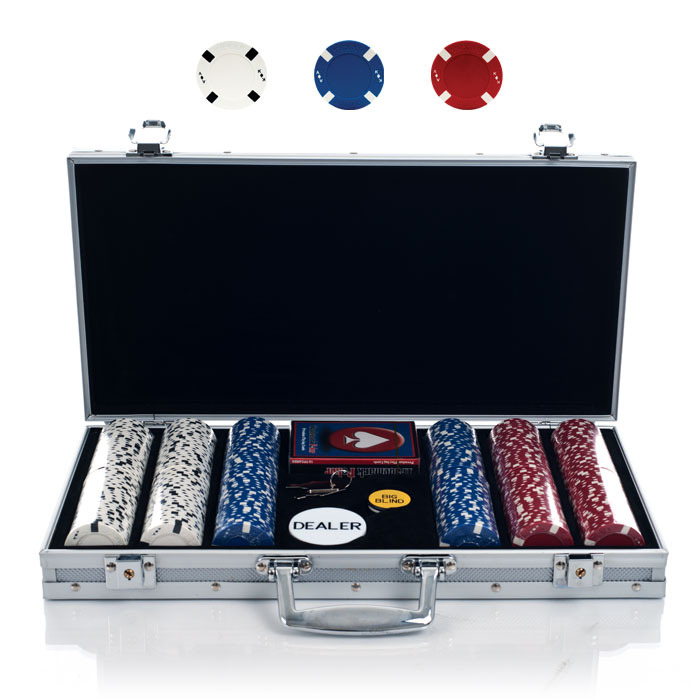 This 300 Chip Set with Aluminum Case has everything you need to get your game off the ground! With the words "TEXAS HOLD'EM" engraved along the outer rim of the chip as well as the famous "Big Slick" suited hand represented with the Ace and King of Diamonds cards, this chip is truely a must have for any Texas Hold'em Poker player! These 39 mm diameter casino sized chips are 11.5 grams in weight. They are produced from a composite resin and an insert that gives them the weight feel of a heavy casino quality chip. The detail on these chips is flawless and their unique design makes them great for casinos and homestyle play alike. The aluminum chip case will offer the most protection for your investment. It's made of heavy duty, yet lightweight aluminum. The interior is black felt lined wood with space for 300 chips, two decks of cards, dealer and blind buttons (all included). Accept no substitute for your poker game or event.